Coconut Meat Is A Great Addition To A Healthy Diet! Cocos nucifera, better known as coconut, is a remarkably versatile plant that provides many culinary and non-culinary benefits from the tree. Coconut trees have traditionally used for building materials, bridges and canoes. The coconut leaves and coconut palms have been used for everything from baskets and brushes. The coconut palm also has been used to make roofs. But it is the culinary uses of coconuts that are what it has been renowned for. Coconuts are an extremely healthy and nutritious food that should be a staple in everybody’s diet. There are many forms of coconuts which are used in cooking, such as coconut oil, coconut water and coconut milk, but I will only discuss the coconut meat here. The coconuts are traditionally found in two forms, fresh coconut meat and dried coconut meat. First there is the fresh coconut meat. You can obtain this by buying a whole coconut at the grocery store. There are two types of fresh coconuts. First is the young coconuts. The young coconut tends to have green shells with a whitish husk. The mature coconuts have the traditional brown shells. Young coconut meat is better for those who are looking to add more carbohydrates to their diet. Mature coconut meat is better for those who are looking to add more protein to their diet. Young coconuts tend to have more water in them and mature coconuts tend to have more meat in them. Unfortunately fresh coconuts tend to be hard to find in grocery stores, so most traditional uses for coconuts have involved dried coconut. Dried coconuts typically are found in bags in the grocery stores and have been used for everything from baking to candy to rice and any other traditional uses for coconuts. Coconut meat nutrition is very high and should be a part of everybody’s diet. Coconuts are a great source of dietary fiber, which can help regulate digestion. Unlike most forms of fiber, coconuts actually taste good. Coconuts contain medium chain fatty acids (MCFA). Medium-chain refers to the number of carbons in a fatty acid chain. The MCFA found in coconuts is particularly efficient in creating energy and boosting one’s metabolism. The fiber in coconuts has been found to lower blood sugar levels because it slows down the conversion of carbohydrates into sugar, thus lowering one’s blood sugar level. 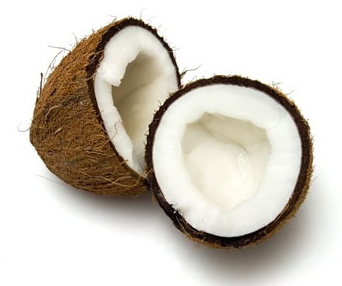 Coconut Meat’s Saturated Fat – Don’t Be Concerned! Coconuts have long been thought of as potentially unhealthy due to its high level of saturated fat. However, coconut oil is different than 98% of all saturated fats out there due the fact that it is a MCFA, as opposed to long chain fatty acid (LCFA). LCFA’s traditionally found in eggs, meat, milk and other plants have long been a source of cholesterol and have had a negative effect against heart disease and heart health. Since the oil in coconuts are a MCFA, it does not have the same negative effects on cholesterol that the long chains do. In fact the acids contained in coconuts helps lower the risks of atherosclerosis and heart disease.